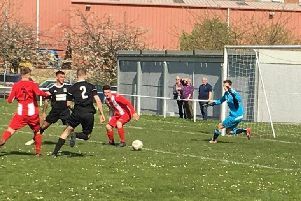 Player-boss Willie Campbell’s last match in charge of Glenrothes Juniors ended on a positive note as they consigned Tayport to a 2-0 defeat at the Warout Stadium. The points came courtesy of strikes from substitute Lee Celentano and Conor Schiavone before Campbell announced his resignation 24 hours later. A “collective effort” from the senior players at the club will help them prepare for Saturday’s match against Carnoustie Panmure who have had an indifferent start to the season. The Glens were still reeling after their 6-0 thrashing at the hands of Forfar West End the week before and were hoping to get back to winning ways. They almost fell behind after just 30 seconds into the clash but Ireland skied the ball over from close range. The Glens started to impose themselves and Walker had a long range shot, but pulled it wide. On 15 minutes Glens had to make a substitution when Lea Schiavone suffered a knee injury and was replaced by Celentano – and it only took him eight minutes to stamp his authority on the game. After a long-range effort from Walker and couple of scares at the other end. Celentano stepped up and curled the ball perfectly into the top corner to give Glens the lead on 23 minutes. A fine run and shot from Buchan was pushed round the post by Shaw as Glens looked to extend their advantage. However, Tayport should have restored parity when Robertson missed from five yards. That miss was to prove important as Campbell’s men doubled their lead less than five minutes later. After an excellent run down the wing from Kinnes, he found Schiavone, and from 18 yards he cut inside and drilled a left foot shot into the bottom corner of the net. Tayport responded with the dangerous Robertson firing another effort over the crossbar. Glens were looking for another goal to kill the game – they almost found it right on half-time as Napier’s goal-bound headed was cleared off the line and scrambled to safety. From the restart, Glens had a strong appeal for a penalty turned down by the official before a cross from Anderson was cleared off the goal line by the home defence. Robertson again tried his luck only to see his effort slip past the post at the other end. The Glens, meanwhile, then produced the best move of the game with some excellent one touch passing only to break down with the final pass. On 82 minutes Robertson again saw a shot slip just past the post. In the final minute, a free kick from walker narrowly sneaked past the post. Glenrothes: Small, Kinnes, Leslie, Campbell, Moffat, Napier, Schiavone,L, Schiavone, C, Martin, Walker, Buchan. Subs: Celentano, Ormiston, Anderson, Pearson, Conner (gk).